Our Northern Region outreach manager shares waterfowl stories and recipes. HUNTING WATERFOWL IS a longstanding tradition in my family. As children, my kids ate many duck nuggets and would often fight over who got the last morsel. The crisp air, lively conversations and the promise of a tasty duck meal are the hallmarks of this tradition. Even my wife (who is a non-hunter, but loves to fish) has enjoyed pursuing waterfowl with me. One year on our wedding anniversary, we decided to take two days to celebrate our marriage. Each day would be devoted to an activity that the other loves to do. Naturally, my treasured hobby was duck hunting. On that cold, snowy November day, we dressed in layers and headed to the perfect spot. 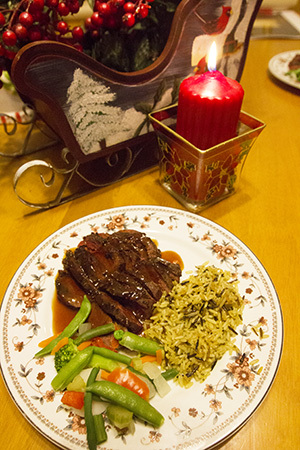 Phil's pan-roasted duck breast with currant sauce. The bluebills were flying and shooting was fast and furious. Zeek, our black lab, was in perfect form in retrieving the downed birds from the icy water. “I really enjoyed watching the dog go out and get the ducks. Seeing his enthusiasm for retrieving was so much fun,” said Traci, my wife. After the hunt, I cleaned the birds and smoke-roasted them over charcoals with cherry wood. I then placed the small, one-inch cubes of meat in an oriental, cabbage salad. This waterfowl preparation continues to be one of our favorites. Wild game cooking is rewarding because of the effort involved in pursuing, obtaining and preparing wild table fare. In addition to the actual hunt, there are countless hours of preparing for the hunt: painting the decoys, repairing weights and lines, training the dog and keeping sharp with shooting for those teal that zip in (and mostly out!) of your decoys. The pride of a successful hunt and the “savory” memories of the experiences afield are enhanced by the care, preparation and enjoyment of a meal provided by the bounties of nature. I’d like to share another easy and tasty way to prepare a duck dinner. Deeply score the skin of the breasts diagonally with a sharp knife and sprinkle with fresh-ground salt and pepper. Turn them over and cook the no-skin side for seven minutes. While the breasts are cooking, make the currant sauce by combining ketchup, butter, jelly and Worcestershire sauce. Simmer in its own pot for four minutes. When the meat reaches 165°F and the juices run clear, remove from skillet and let cool for a couple of minutes. Slice the meat thinly with a sharp knife and pour the sauce on top of all breasts evenly. *Depending on the thickness of the breast and the type of skillet and stove, cooking times may vary. Cook until the skin is golden brown and the juices run clear. USDA recommends cooking duck breasts until they reach a safe minimum internal temperature of 165°F. Served with wild rice and steamed vegetables, this is a rustically elegant and delicious meal!